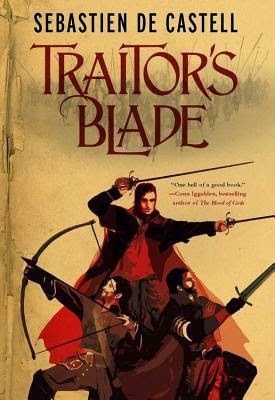 Traitor's Blade is the first book in the Greatcoats series, a planned series of four books and several novellas, and I enjoyed it quite a bit. I don't think I've ever used the word 'swashbuckling' to describe a novel before, but I couldn't get my mind off The Pirates of the Caribbean' and 'Les Trois Mousquetaires" while reading this and that word came up over and over again, 'swashbuckling" fun. Exuberant also came to mind as well as adventurous, but they didn't seem to do justice to a novel that was just plain enjoyable fun. The three main characters, Falcio, Kest, and Brasti, are three Greatcoats who lost their positions when their King was murdered several years ago. Left to travel the world on a great quest set by their king, they tended to find themselves in quite a few predicaments. I really enjoyed the banter between them, the type of banter that develops amonst people who have known and worked together under duress for a very long time and who have dealt with a lot of really difficult situations. That they care for each other and admire each other's talents and skills is never under doubt, and that they trust each other is unquestionable. We learn more about Falcio than the others only because we spend more time with him and because he is the narrator of the story. A smooth talker by nature, Falcio is quite interesting as a character due to his unpredictability. Fierce, strong, and loyal (he kind of reminds you of Strider / Aragorn of Lord of the Rings), one who can sweet-talk the birds out of the trees, and then the next thing you know he was in the middle of a fight and you didn't even see it coming. There was also a dark side to him that you learn about throughout the novel. I really enjoyed the plot as there was a lot going on; it was very fast-paced with a lot of problems for the characters to deal with, and constant obstacles thrown in their direction. Just when I thought I had things figured out, something else would come along and I would have to change my thinking or I would forget about some tiny little detail that would become important later on. The medieval-like world with a touch of fantasy was interesting, and there were certainly the traditional fantasy elements included such as the quests, the magic, the gods, the creatures such as the fey horses. Traitor's Blade was fun to read and I enjoyed it a lot. There were many of the usual elements of fantasy in it set in a medieval-like world, but to say the novel was light would do it a disservice; there were many moments that touched on the darkness of the world, and in people's hearts, and the underlying issues in Falcio's world, the evildoing of the Dukes. I thought the author did a great job showing the reader the true issues in Falcio's world, like a cake with beautiful icing, but the core is rotten and everything will slowly fall inwards unless something is done. If you are looking for some good entertainment, then you will definitely enjoy this novel as Falcio and company definitely provide that, but don't overlook the grim overtones that shadow this novel, and the heavier themes that lie under the surface. I can't wait to read Knight's Shadow, the next book in this series which releases March 5th. Honor student Emma knows more about galvanic cell diagrams than guns. College is the only way out of her gang-ridden hometown, but her parents can't afford it. When her unemployed dad lands a job as a census taker, things start looking up. But he's sent deep into East Malo Verde, where gang members rule the streets and fear anyone with a badge who knocks on doors. One night, a gang member mistakes him for a cop and beats him savagely, leaving him for dead. Her best friends, her chem lab partner, her mom, and the detective assigned to the case all try to convince her to focus on school. But school won't prepare her for a world that ignores a crime against a good man. Emma must decide what's more important: doing what's expected, or doing what she feels is right . . . even if it leads her down a dark and dangerous path of revenge. I love history. I own a Marie Antoinette costume, wig and all. It really bums me out when the History Channel puts on car shows or pawn shows because they’re not about kings or queens or warriors or revolutions or far-away countries. When I started to write my latest book, The Red Road, I knew it couldn’t be a historical. It had to take place in the here and now because it’s the story of my own family (well, with a few teensy additions…like guns and gangs). So what’s a history lover to do? Turns out, it was easier than I thought—and better for the story—to put echoes of history into the book. In the book, 16-year-old Emma is in AP US History. In all the classroom scenes, I made sure to match up the subject material with what’s going on in Em’s life. Early in the book, a boy named Dan starts hanging around Emma’s locker, which makes her friend Via jealous. They have a hard time talking about their feelings, and find it much easier to argue over the material in history class—the Missouri Compromise. The two girls argue over whether the North or the South got the short end of the stick in the Missouri Compromise, but the reader knows they’re really arguing about themselves. On the day the teacher, Mr. Parker, tells the class about the Alamo, Emma’s father has just been beaten and left for dead by a gang member. In Em’s hometown of Malo Verde, California, Mexican gangs rule the streets. When Em comes to class after finding her father barely alive, the first thing she hears is the story of the Alamo. Mr. Parker tells them that Americans had been settling in greater numbers in Mexico and the Mexican government wanted them to stop. When the settlers wouldn’t leave, the two countries began to fight over territory. This reflects the tension in Malo Verde, both between the two gangs present (Norteños and Sureños) and the gangs and the townspeople. Emma gets to see how the historic situation unfolded (here’s a hint: it’s bad), and the reader can only hope she’ll keep her personal situation from turning to tragedy, too. I hope these parallels make the story even richer and deeper for history nuts like me. I had such a good time going back to high school history and finding new ways past events echo the events in our lives today. 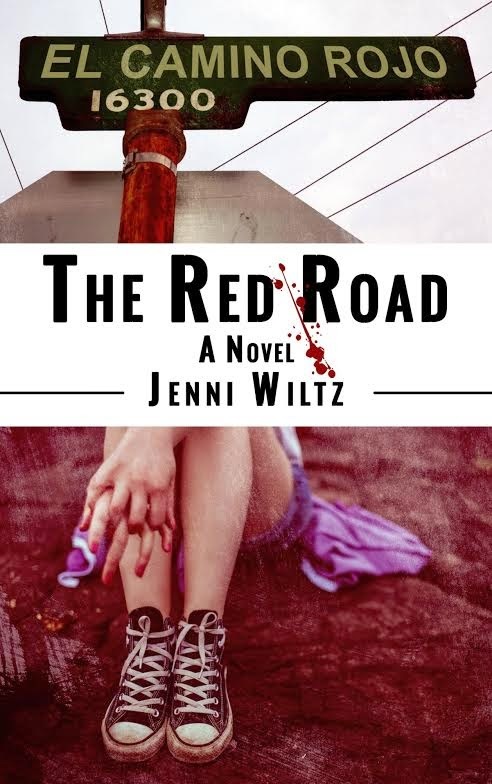 If you enjoy dramas with a touch of romance and suspense, I hope you’ll check out The Red Road! 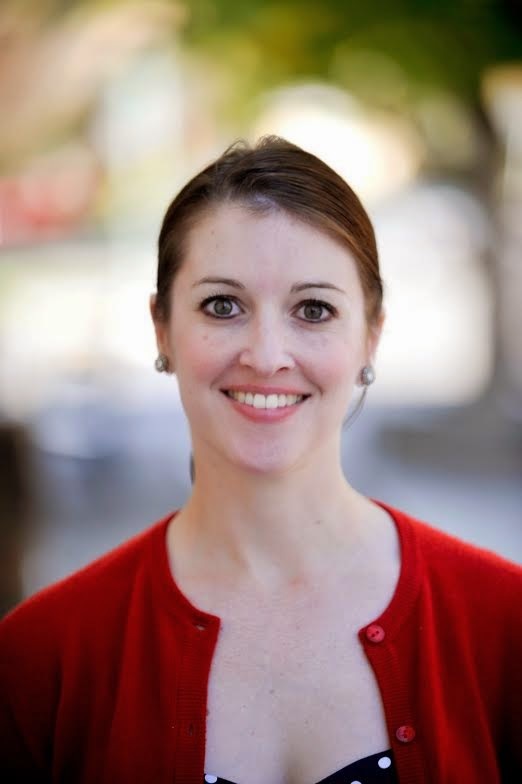 Jenni Wiltz writes fiction and creative nonfiction. She’s won national writing awards for romantic suspense and creative nonfiction. Her short fiction has been published in literary journals including Gargoyle and The Portland Review, as well as several small-press anthologies. When she's not writing, she enjoys sewing, running, and genealogical research. She lives in Pilot Hill, California. Visit her online at JenniWiltz.com. Connect with Jenni on Facebook, Twitter, Pinterest, Google+ or Goodreads. When is one of those books that I began reading with a bit of trepidation as I am a huge fan of the author's Psychic Eye and Ghost Hunter mystery series and worried that her foray into young adult might be a bit too much for me. I'm glad to say I didn't have to worry as I really liked this novel, enough to have me reading over 200 pages in one night in order to finish it. 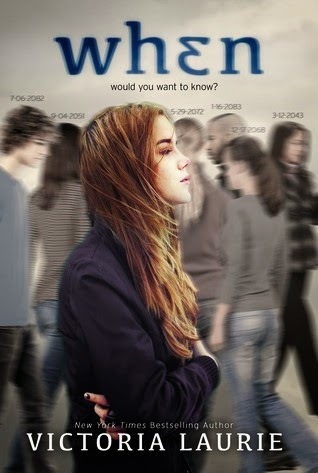 I thought the idea was original and liked the main characters very much, especially Maddie's friend Stubs. I was drawn into the story fairly quickly and thought the plot was actually quite good. Maddie can see numbers on people's foreheads and as a young child, didn't understand what the numbers meant until disaster struck her family. The idea was quite intriguing and right from the beginning, I wondered if there was a way for those numbers to change; I mean life is full of possibilities, and any choices we make can always alter the future. It was definitely an interesting thing to think about as I read through the story, and wondered how far the author would actually take the numbers thing. I was quite satisfied with what happened in that regard, and thought the author handled the concept quite well. I liked Maddie very much as a character; she was confused, had low self-esteem, worked hard at school in order to get a scholarship one day, was loyal to her friends (even when one of them got involved in what was happening and was accused of things, she remained staunch and loyal), cried when things were too difficult for her to handle, and was stubborn as well. There were times when I did want to shake her, but she is only sixteen, and can't behave like an adult every moment of the day; it just made things more realistic. I have a teenager at home and I wouldn't have believed it otherwise if her behaviour was always exemplary, and she didn't have moments of "teenagerism". Where I did have to suspend my belief however, is towards the FBI and their original treatment of her. Having very little proof of her guilty actions on said day of murder, the agents came down pretty hard on her and I wasn't too thrilled with how that storyline went down. Interviewing a minor without an adult present, in front of others, just wouldn't have happened, unless corruption was going on, which there could have been. The principal would have known exactly what the consequences of that action would have been, which I thought was handled very well, but it shouldn't have happened in the first place. Can corruption happen? Yes, but this is not the place where I am even going to touch that argument, I just thought it could have been handled better in the book, and I work in the educational field. Going with that thought though, the author seems to have several themes running through this novel: we've got the alcoholism one with her mother, bullying at school from both students and teachers, harrassment from police officers, loyalty, trust, and friendship themes, and the concept of not judging someone until they have been proven guilty theme. When was an enjoyable read and the pacing and suspense of the novel kept me interested enough to pretty much read the whole thing in one sitting. I liked both the main and supporting characters, and thought they developed quite nicely, helping to set up some of the challenges that Maddie faced while dealing with the prospect of being labeled a murderer. The plot was fun, although I was really skeptical during some of the police and school scenes; it was not always easy to suspend my disbelief and just read the story. Warner Brothers has already picked up the rights for this book for television so I thought that was interesting. And the book was left open enough at the end for a possible sequel. No Known Grave is the third book in the Detective Inspector Tom Tyler series and is the first one of the series I have read. I am actually very familiar with Maureen Jennings however, having discovered her a long time ago when I read Except the Dying, a Detective Murdoch mystery novel. I have been a huge fan ever since, and since I tend to be a huge proponent of Canadian authors, I have continued to follow the releases of her novels. No Known Grave was of high interest to me, especially as I teach history, including courses that focus on the Great War and World War II. Tom Tyler was a great character and he really grew on me throughout the novel. I felt a lot of sympathy towards him as he fielded questions and prejudice as to why he was not fighting on the front with his peers, or why others he worked with were also not on the front. Some of the men kept having to explain why they were doing the jobs they were doing, why they were rejected by the military, or why they had to return from the front and were no longer fit for service. I felt bad for them having to justify to others why they were not "doing their duty" and fighting for their country. I had to keep in mind that it was 1942, during a very difficult time of the war for Great Britain, and people were suffering. The US air force had just barely arrived in the UK and Operation Rutter (Operation Jubilee) or more familiarly, the Battle of Dieppe, was still over a month away. The research was quite impressive, and it was the little things, written so carefully, yet so descriptively, that really made you understand how difficult life was during this time period, and how much people were struggling for the little luxuries in life. My heart was especially torn for the victims in the convalescent hospital who were trying to rebuilt their lives after horrifying accidents on the battlefront. This is where most of the action took place, and it was touching to see how these nurses, pilots, etc... were trying to deal with the life-altering injuries they incurred while on duty. I thought the author handled it all very well and I never thought too much about the injuries after they were described, and it came as a shock sometimes to realize that so and so didn't have a hand, or about the scarring on someone's face as you were reminded about it through incidents that happened. It made you sympathetic towards them even though one of them could have been a murderer. And I will admit, it took me a while to figure out what was going on, and who it possibly could have been. The murders served to remind Tom that even though they thought they were safe from the battlefront, the effects of the war were far-reaching and long-lasting. It made you really think about how strong and resilient people had to have been during this time period. 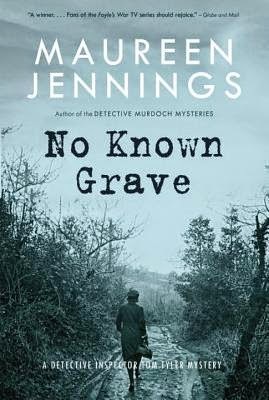 No Known Grave was an interesting and thought-provoking mystery set during World War II in Great Britain. Set during a time period when the UK was really struggling and the US, while it had entered the war, had not yet made their presence known in Europe at this point, and the people were suffering and were on severe rations. Prejudice was a bit high and pretty much everyone had been touched in some way by the war. The plot was interesting and moved along nicely, leaving me guessing quite often as I changed my opinion on who the murderer was as evidence became more clear until I finally figured it out. I like those novels where I don't know who the murderer is right from the beginning. The descriptions were very well done, and I enjoyed it very much. I look forward to reading another Tom Tyler mystery in the future. As a detective lieutenant with the LAPD, Peter Decker witnessed enough ugliness and chaos for a lifetime. Now, he and his devoted wife Rena Lazarus are ready to enjoy the quiet beauty of upstate New York, where they can be closer to their four adult children and their foster son. Murder 101 showed a lot of promise as Peter Decker finally did what he threatened to do for over three books now, and that was retire, and moved across the country to Greenbury, a much smaller town than LA. I was looking forward to a return to a simpler detective story, one of those small town stories where a murderer lived in the midst of everyone for years and no one actually knew about it. However, that was not to be, and I was somewhat disappointed in that. Decker's new partner is a Harvard graduate named Tyler who really has no formal training in law enforcement, but happens to have "connections." It doesn't take long for Tyler to get under Decker's skin and aggravate him by his lack of knowledge and some of the bantering and conversations between them were actually quite interesting and fun, maybe the better moments of the book. Tyler is whiny, and really doesn't like to do work, but we eventually learn that the major problem is his relationship with his father who is rather well-known in New York. One of the things I enjoyed in this novel was Tyler's development as a character and I've developed a fondness for him I did not have at the beginning of the novel. I am curious to see what the author will do with his character as he is supposed to be heading to law school as his assignment with Decker was only temporary. The other good surprise was seeing more of Rina, Decker's wife, but it still wasn't enough for me. An extremely intelligent woman, she made some rather good suggestions on how to proceed with the case, and I rather liked seeing her more involved in Decker's work. I did think that someone with Decker's experience could have figured out some of the things for himself, and it was just a tool to introduce Rina more into the book and show us that she would be more involved in the future, but I overlooked it as I have missed her these past few novels. Despite all of this, even though the new setting kind of brought Decker back to life, I did feel like the plot was a bit...boring. The art information was interesting, and I always like that kind of thing, but the continuous driving back and forth to Boston and then New York, which I am sure would take longer than 1 1/2 hours (but I'll leave that up to people who actually live there, and not to my more faulty memory of only one trip there), got kind of tedious and sort of made you lose track of the reasons for going to these places. I'm also not sure why everything has to be this big international thing all of the time; what happened to those old-fashioned mysteries that take place in small towns and it was the sweet little old lady who did it by putting arsenic in someone's tea cup? Sometimes simple is better. 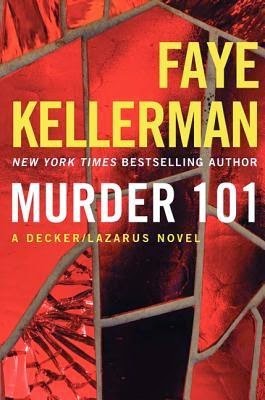 Murder 101 was a fast, okay read that I did enjoy as I have always looked forward to a Peter Decker novel. The past three or four novels were not my favourites in the series, but this one seems to have brought a little life back to Decker with new characters and new places and new targets. I do wish the plot didn't always have to be this big international thing in nature as a lot of motives for crime that are interesting do happen at home and are not big international crimes, you know? I did like how the author was able to balance family time with the actual crime scene components as I think it is good to see Decker able to relax and enjoy his semi-retirement somewhat. I will probably read the next one in the series to see what happens, and after that, we'll see. Little remains of the Aztec and Mayan civilizations after being vanquished by the Spanish Empire. From the ashes of their cities emerged a unified legend: their conquerors possessed a mysterious artifact so powerful—so deadly—that it was known as the Death Relic. Despite its infamy, little else is known about the object, which was lost long ago. When archaeologist Maria Pelati’s research team disappears in the Yucatán Peninsula, she enlists Jonathon Payne and David Jones to find them. As they embark on their perilous mission, they realize that Maria’s research could be the key to solving one of the darkest mysteries of the New World and unearthing the secret of the Death Relic. The Death Relic is the seventh entry into the Jonathon Payne and David Jones series, and so far it is my least favourite entry of the series. Usually, I adore Payne & Jones and look forward to their adventures and their bantering, but this one got on my nerves as the banter sounded awkward and was, at times, just downright annoying. Those of us who have already read the books in this series are already familiar with Maria Pelati, but I will admit I liked her a lot better in Sign of the Cross. While I understand why she is so prickly towards Jonathon as I have read Sign of the Cross, it just came across as whiny and immature rather than for reasons that were legitimate and real. And the author also assumes that the reader is familiar with the reasons for her aloofness and her coldness; and even though I was familiar, it didn't make me sympathetic towards her character whatsoever, rather it made me dislike her. She constantly interfered when Payne told her not to, putting what he was doing jeopardy, even if he made light of it afterwards, something that made me grit my teeth quite often. Sign of the Cross and The Plantation were fast-paced and more original and I enjoyed them very much. While this novel had the same fast-paced format, it wasn't very original in nature, and was a bit formulaic. 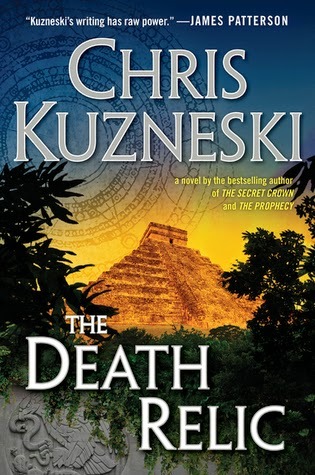 It's not that I didn't enjoy any aspect of this novel as I did enjoy the trips to Chichen Itza and Tulum, both places I have visited so it was easy to picture the action scenes in my head. Having just recently been there however, some of the descriptions were a bit vague and a bit off, but I can overlook that. And I thought the plot was actually okay; it was all of the incidental little things that were bothersome. It's just one of those books you read without thinking, just because you can. The Death Relic is one of those novels that is good mindless fun. It's one of those books where you hold suspension of belief, and just go along for the ride, and there's absolutely nothing wrong with that. I enjoyed it when I read it from that aspect. If you look at it more seriously, then the plot is predictable and formulaic, and the bantering definitely gets on one's nerves. To be honest though, I find lately that a lot of these types of novels are pretty formulaic so that doesn't bother me too much. What bothered me more was the way it was written as it seemed forced and tried too hard to add the action and the humour, which fell flat for me. Will that stop me from reading another novel by this author? No, definitely not. The Forbidden Tomb is next on my list. 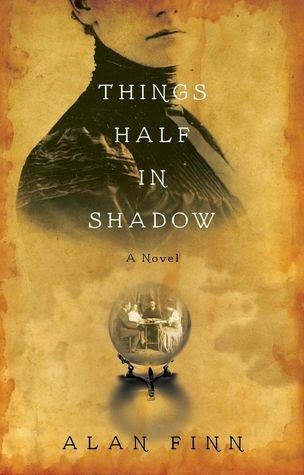 Things Half in Shadow was a captivating tale, taking place in Philadelphia several years after the American Civil War. I mention the Civil War because so much of it permeated the atmosphere of this novel, and drove the growth of mediums who were often accused of using sleight of hand and illusions to rob families that were grieving. There was a real development in the interest of the supernatural and whether it was real or not, occupying a large part of many discussions during social visits. When we first meet Edward Clark, it is from the future, as he is enticed by his granddaughter to write down his ghostly tales and adventures from his youth, so you already know that he survived, and married, and had children. All this did was entice and intrigue me as well and I was pretty much captivated from that point; I had a pretty hard time putting down this novel. Written in the first person, I found myself empathizing with Edward and really felt like I was there. I was able to share in all of his emotions as well as view Philadelphia from his viewpoint and I liked that a lot. The author is very skilful as I found myself liking what Edward liked and disliking what Edward disliked; once I realized what was happening, I had to distance myself a little bit in order to take stock of what was really happening, and think about the suspects, and it was only when stepped back that I was able to figure out who the murderer was. Like I said, it was very skilfully done, and I was very appreciative of the author's writing ability. I really enjoyed the character of Edward, but I will truthfully admit that it was Lucy Collins I adored. Edward was everything I could wish in a character; he was brave, funny, awkward, dashing (when warranted), nice, and conflicted. He is one of those wealthy men who prefers comfort over show, likes to work rather than be idle (he works as a crime-reporter), and associates with people others (as in a future father-in-law) would deem unacceptable. Lucy, however, is one of those characters whom I despised at the beginning, but absolutely adored towards the end. She has this way of growing on you, despite her sharp edges, and I found myself rooting for her and hoping things would turn out the way I wished. Because of her, the author was able to slide in some issues and themes during this time period such as spousal and child abuse and women's rights which made me compare our societies quite a bit. There was also some discussion around education and a woman's dependance on her husband, both socially and financially, especially when things go wrong. Things Half in Shadow was much more than I expected, and the only disappointment I had (which is not really a disappointment, only for the waiting period) is discovering I have to wait for a sequel to discover more about the adventures of Edward and Lucy. This novel had everything I could want: intrigue, secrets, murder, mystery, and so on. There was even a bit of the paranormal for those of you who enjoy that aspect. Mr. Finn has a writing style that grabs you and makes you feel part of the story, makes you feel like you are in 1869, with excellent research and the inclusion of historical figures such as P.T. Barnum. Definitely an author I am looking forward to reading more from in the future. Happy New Year and First Book of the Year!! Happy new year everyone! I wish all of you the best in the upcoming year, and to all book bloggers out there, many happy reading days to come!! I was planning to get some serious reading done today, but things haven't quite worked out that way as there was the tree and decorations to take down (if I didn't, the possibility of them still being up in June would be pretty high LOL), as well as other small, menial tasks that needed to get done. I haven't been blogging very much the past several months because life sort of got in the way, and unfortunately, blogging had to take a back seat. I didn't make any resolutions with regards to blogging as I don't know how much things will change in the near future, but that's just life. I would like to explore a bit more into the science fiction / fantasy world this year as I feel like I've really neglected that aspect of my reading and I miss it very much. I always participate in reading challenges because I like them, they're fun, and they keep me focused on what I am doing. 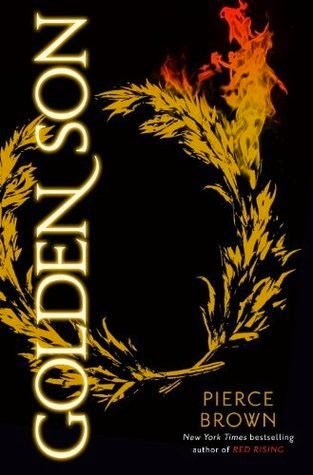 My first book of the year is Golden Son by Pierce Brown, hosted by Book Journey. I have been waiting to read this for a very long time, and I promised myself I wouldn't touch it until the new year. Red Rising was one of my favourite books last year. 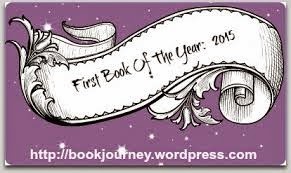 What is your first book of 2015 going to be? ?